Our family was long in the habit of having pizza on Christmas Eve; it’s easy to organize for a crazy, mixed-up and chaotic evening, with about three generations present. Either take-out or deliverer - even a selection of frozen or ready-made grocery store pizza would do. There’s a variety to suit every taste, everyone can have as much or as little as they like, eat it off paper plates, and clean-up is a snap. This year, we varied the program, mostly because my mother sent us a massive gift basket from La Tienda, which specializes in the classic foods of Spain, where my daughter and I lived for six years. We fell upon it with cries of happy delight, reminded of certain foods that we loved. There was a box of turron: a slab of almond nougat that was ubiquitous in Spain at this time of year, a box of marzipan, even some dried figs dipped in dark chocolate; dried fruit in dark chocolate was a specialty in Aragon. 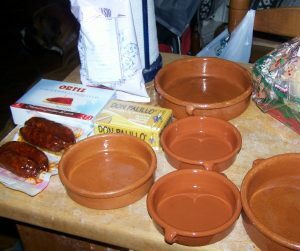 There were three kinds of Spanish chorizo - spicy cured salami, not raw sausage - a bag of Spanish-style potato chips (not any different from the usual that we could see), and four little pottery serving dishes called cazuelas. 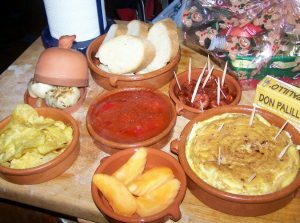 I had the idea to serve a tapas dinner on Christmas Eve, with some of our favorite tapas that we remembered, with a loaf of fresh-baked European-style bread and some roasted garlic on the side. Which is what we did - I loaded up a tray with all kinds of goodies served up in cazuelas; little chunks of chorizo, and a dish of tuna-stuffed red peppers in tomato sauce from the gift basket, some fresh cantaloupe melon – and a fresh-made tortilla. 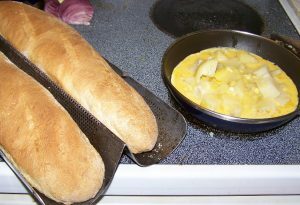 Which is actually a frittata made with potatoes and garlic. I would have liked to make ensalata del pulpo, but ran out of time. The tortilla is simple enough: one large potato, cooked, peeled and cut into chunks, 4-6 eggs beaten together, one clove garlic, finely chopped. Heat about 1 tablespoon each olive oil and butter in an 8 inch omelet or frying pan. When the pan is sizzling hot, pour in enough of the egg to cover the bottom of the pan, and cook just long enough to solidify. Then quickly scatter the potato chunks and the garlic on top, and add the rest of the beaten egg. Turn down the heat so the bottom layer will not toughen but the remainder is cooked until the top is just beginning to set around the edges. Put a plate on top of the pan, and holding them together, quickly flip the pan and plate, so that the omelet/frittata is on the plate, bottom-side up. Add a little more oil and butter to the pan, and slide the omelet/frittata back into the hot pan, so that the other side may cook. When done, cut into bite-sized wedges to serve. Dice cooked meat from 2 medium octopi (or 2-3 cups cooked frozen octopus rings) and combine with 2 small green peppers, 1 small onion, 1 small tomato all chopped finely, 1 tablespoon chopped parsley and two cloves minced garlic, ¼ cup olive oil and the juice of half a lemon, with salt to taste. Bon appetite – and happy new year!